(Bloomberg) -- A 5-foot-tall basketball with a chair hidden within is the centerpiece of Jonas Wood’s Los Angeles studio -- a throne that burly men could parade around on a festive occasion. Wood, an avid sports fan and card player whose paintings have depicted NBA Hall of Famers Kareem Abdul-Jabbar, Charles Barkley and Bill Walton and poker legend Doyle Brunson, has plenty to celebrate. His first museum survey in the U.S. opens this week at the Dallas Museum of Art with more than 30 paintings, including portraits of his family and friends. Billionaires Yusaku Maezawa and Eli Broad, Guess founders Maurice and Paul Marciano, as well as museums such as the Whitney and Guggenheim, are among those loaning works for the event. Wood, a burly 6-foot-3, often appears in public sporting a beanie and baggy pants and has risen from obscurity to the top of the contemporary art pyramid. His auction sales generated $13.2 million last year, the most of any artist in the “ultra-contemporary” segment, according to Artnet. Next month, Gagosian gallery will stage its first solo show of his new works in New York, with prices for some pieces exceeding $600,000. In May, a 10-foot-tall painting of a flower pot fetched $2.3 million at Christie’s. The “riot of colors,” rich patterns and complex forms that vacillate between realistic and abstract, the flattening and deepening of space “sets him apart and makes him the leading realistic painter of his generation,” Godsill said. 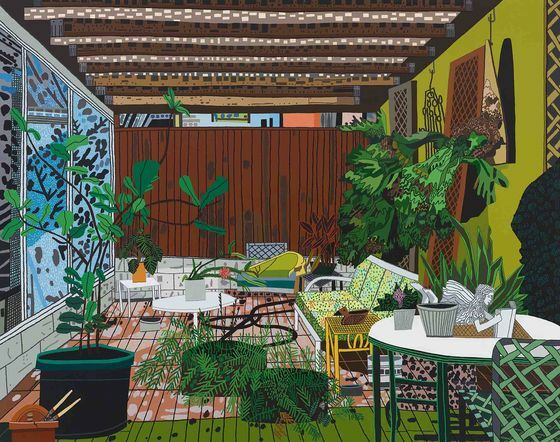 Working in traditional genres of portraiture, still life and landscape, Wood joins a lineage that stretches from modern masters like Van Gogh, Picasso and Matisse to contemporary stars David Hockney and Alex Katz. “It’s just my range happens to be a bit wider because I say that tennis court is a landscape painting and a basketball player is a portrait,” Wood said. Friends and relatives are as central to his work as basketball and poker. 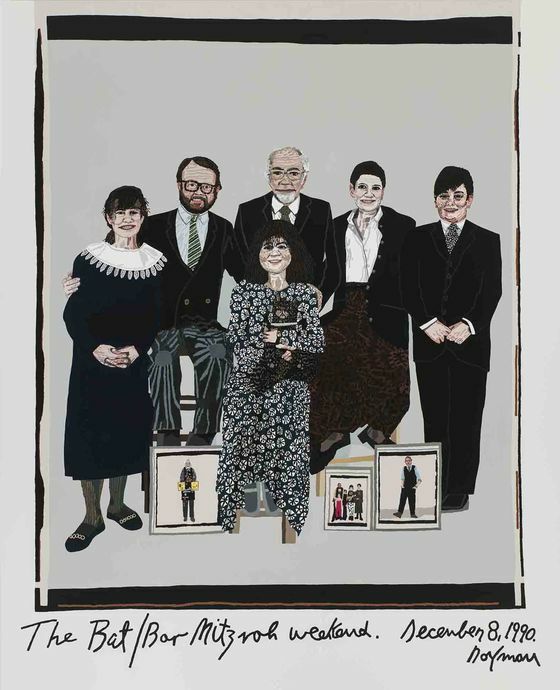 A 1990 photo in which he appears with his parents, sisters and grandfather is the source of “The Bat/Bar Mitzvah Weekend,” a 2016 painting on display in Dallas. Wood has “no separation” between his personal life and artistic practice, according to Sam Orlofsky, a Gagosian director. On any given day, he may be painting while watching basketball on television and listening to a poker podcast. 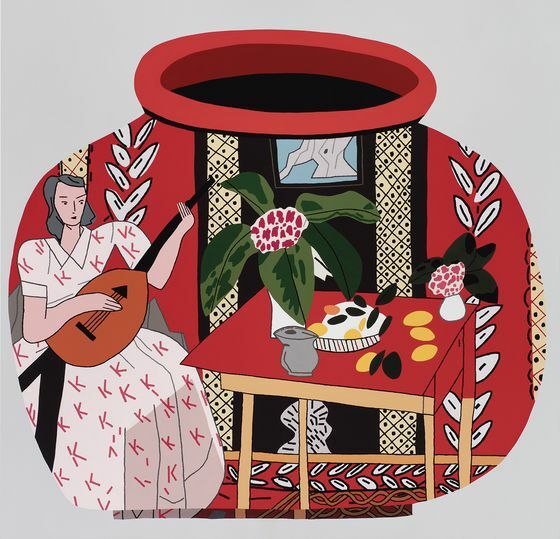 Nearby his kids would be drawing and these drawings would later appear on the ceramic pots made by Wood’s wife, artist Shio Kusaka, which in turn are frequent subjects of Wood’s paintings. “It’s like Russian nesting dolls,” Orlofsky said. Wood, who grew up outside Boston and still considers himself a Celtics fan, was profoundly influenced by his father, an architect, and his mother, a high school drama teacher. She would stage five to six plays a year and he spent a lot of his free time watching her build sets, paint backdrops and create handmade costumes. Wood also was influenced by his grandfather, a pediatrician who became a collector of Andy Warhol, Francis Bacon and Roy Lichtenstein, and became an amateur artist himself later in life. Wood realized he could become a professional artist in 2000, when he entered the master’s of fine arts program at the University of Washington in Seattle. Wood and Kusaka met in Seattle and moved in 2003 to Los Angeles, where both got their start as studio assistants for more established artists. He eventually met art dealer Jeff Poe and artist Mark Grotjahn, who had become his poker buddies by the time he had his solo debut in October 2006. All of the works sold. Grotjahn, a star L.A. artist, bought a painting and tipped off his New York dealer, Anton Kern. Wood, fortified by the $29,000 he made from his first show, focused on his New York debut, which came nine months later at Kern’s gallery in Chelsea. He also started hosting $1,000 buy-in No Limit Texas Hold ’Em games at his studio and using poker as a subject of his paintings. 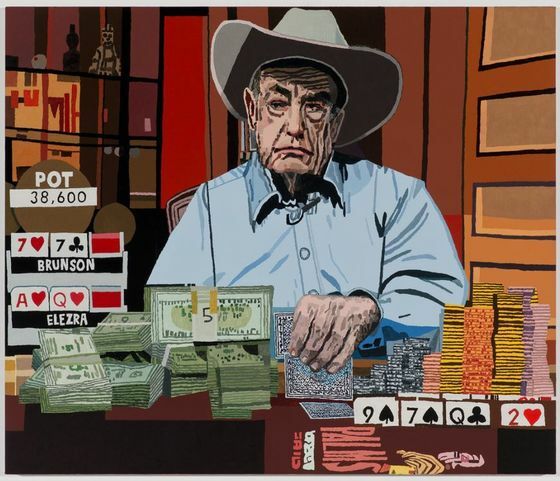 His 2013 canvas “Doyle” depicts Brunson, a two-time winner of the World Series of Poker main event, in a cowboy hat as he sits behind bundles of cash and towers of chips, with a winning hand that has opponent Eli Elezra drawing dead. The 13 years since Wood’s debut have been marked by an unprecedented expansion in the art market. Investment-grade art became the obsession of hedge fund billionaires and new buyers from Asia seeking fresh talent and blue-chip names. Early collectors of Wood’s work include advertising mogul Charles Saatchi. But auction prices didn’t take off until 2015, when Gagosian staged its first show of Wood’s paintings and Kusaka’s ceramics in Hong Kong. That year, 32 Wood works hit the block, generating $5.5 million, according to Artnet. A painting bought by Saatchi for $60,000 in 2009 at Anton Kern went on to fetch $837,449 in October 2015 at Christie’s in London. As Wood’s star rose, he caught the collecting bug himself. The sprawling studio he shares with his wife, behind a metal gate in Los Angeles, displays paintings by Josh Smith, Math Bass, Alighiero Boetti and Tony Matelli. “Collecting is an addiction,” Wood said. He commissioned the giant basketball from Ghanaian artist Paa Joe, who specializes in novelty coffins.